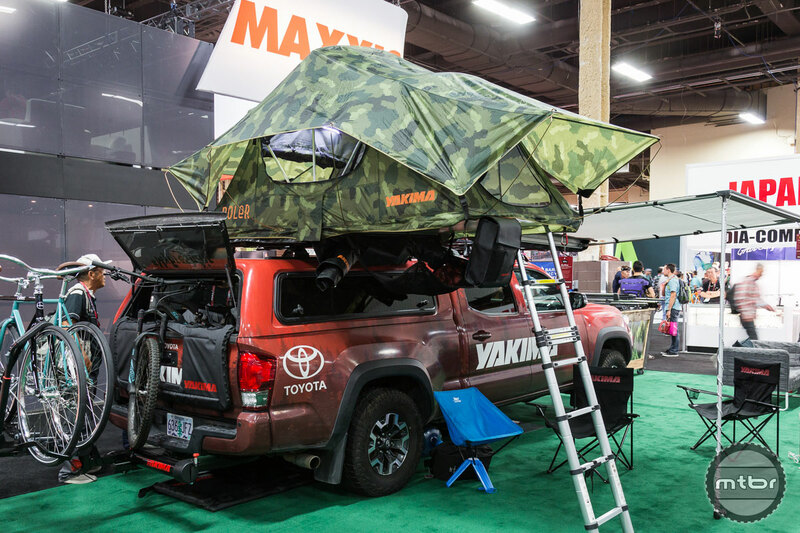 Portland-based Yakima has updated some of its most popular racks, improved its tailgate pad, and launched a cool camo version of its SkyRise rooftop tent. Here are all the critical details, launch dates, and prices straight from the Interbike trade show in Las Vegas. Hauling bikes behind your car or truck shouldn’t mean not being able to get to your tailgate or trunk. 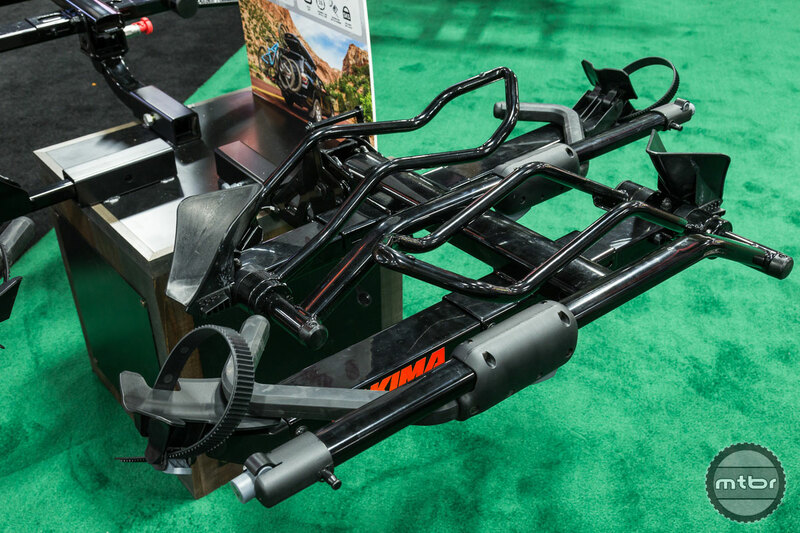 With Yakima’s new BackSwing mechanism, it’s never been easier. Simply pop up the security pin and your rack swings out of the way. This $299 add-on device works with any Yakima (or most other brand’s) rack and holds up to 250 pounds, meaning you can haul four bikes. Availability is set for spring 2018. Also new from Yakima is the GateKeeper tailgate pad, which includes several key updates from the previous version, including padded individual bike cradles and a window cutout so you can still use your vehicle’s back-up camera. The GateKeeper comes in 5- and 6-bike versions and sells for $139 and $149 respectively. Availability is set for February 2018. 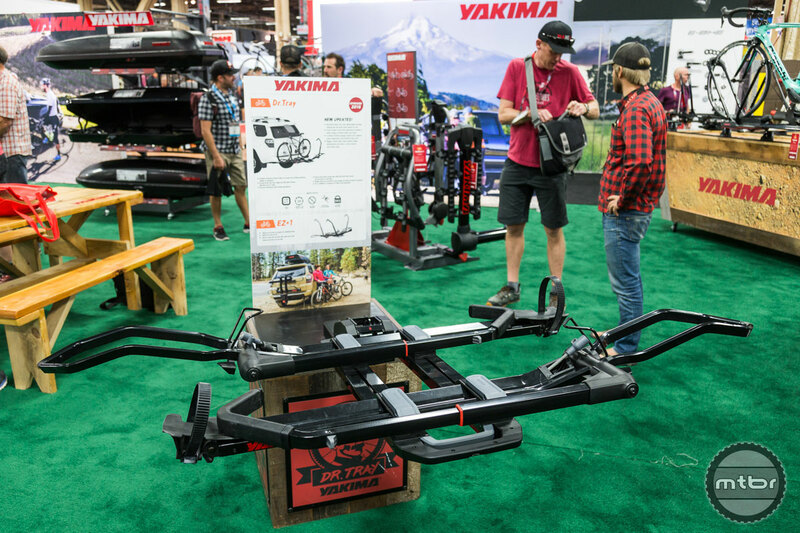 Yakima has also added fat bike-carrying capability to its HoldUp tray rack. The new HoldUp Evo can carry the fattest of fat tire bikes, is lock secured, and has both a pull lever and kick plate so it’s easy to raise or lower the rack out of the way. Price is $499 and it too will be available starting in February 2018. You can also get a single bike version of this rack for $259. 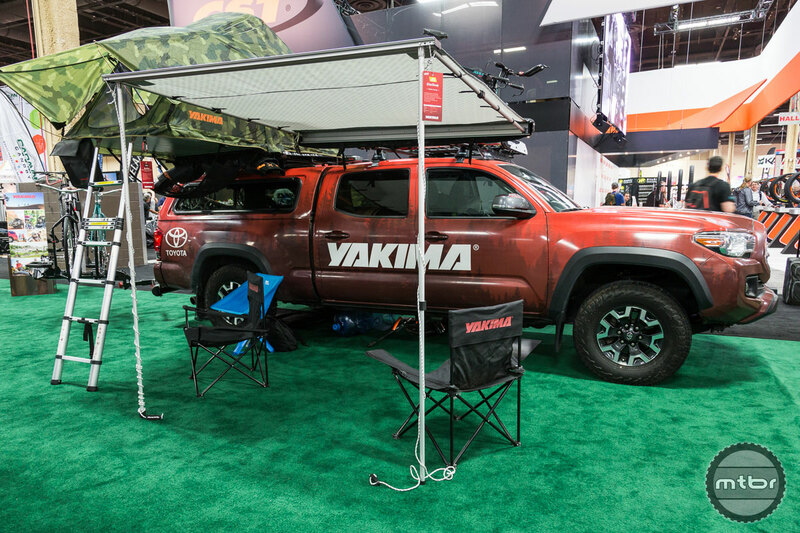 Finally, Yakima is launching a co-branded (with fellow Portlanders Poler) camouflage-version of its popular SkyRise rooftop tent. 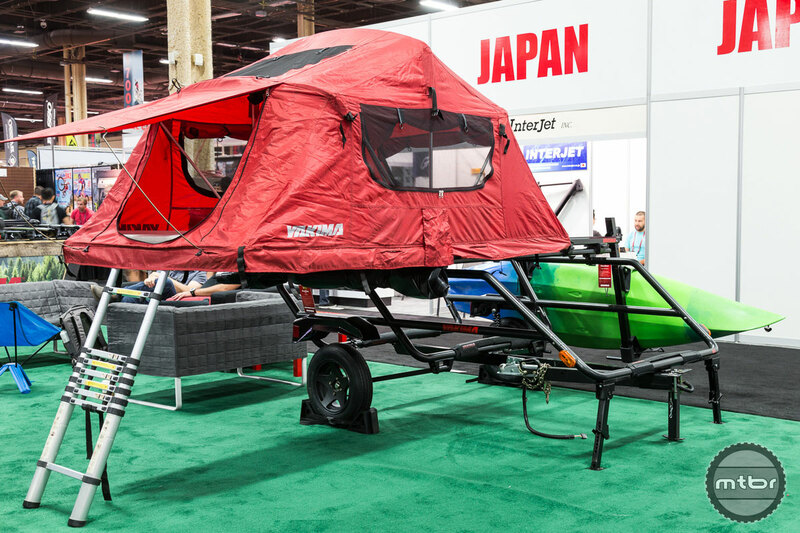 It will only be available in a 2-person version and comes with a ladder, rain fly, and mattress. 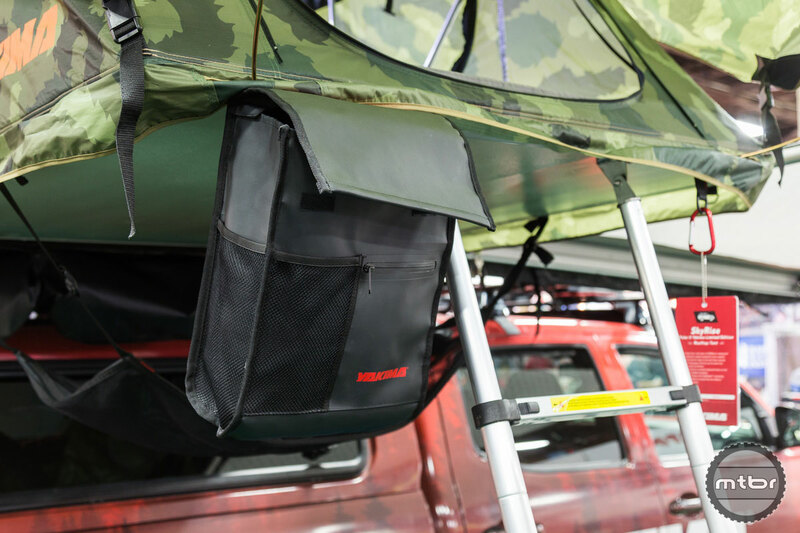 New camping accessories include a shoe bag, gear net, fitted sheets, and even an LED lighting system. These are all sold separately. 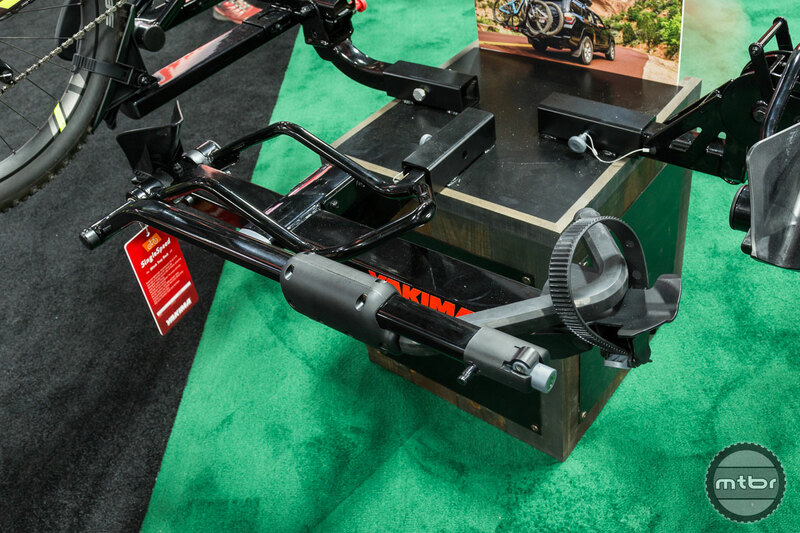 With Yakima’s new BackSwing mechanism, it’s never been easier. Simply pop up the security pin and your rack swings out of the way. 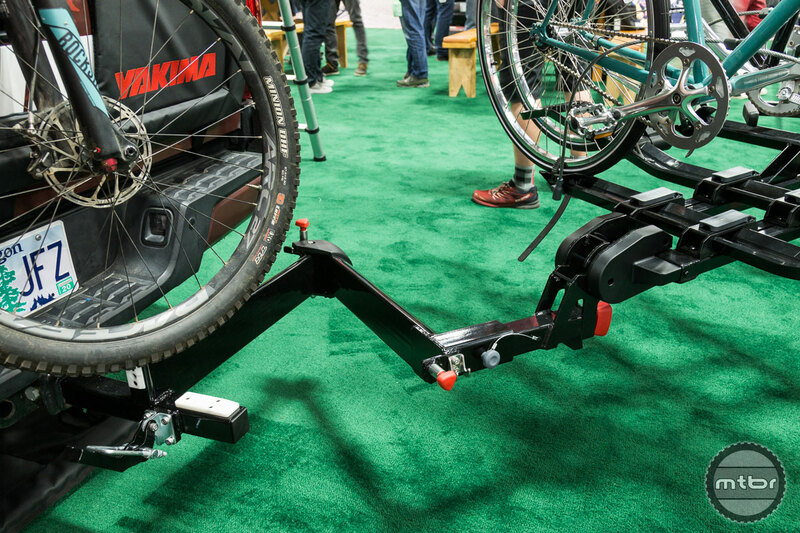 This $299 add-on device works with any Yakima (or other manufacture) rack and holds up to 250 pounds, meaning you can haul four bikes. Availability is set for spring 2018. Dr. Tray is the ultimate bike tray rack for your hitch. It can easily handle road, mountain, and fat-tire bikes with up to 5” tires. Bike clearance is top notch, with 18” between the trays. To make it even better, the bike tray spacing can be adjusted tool-free while the bikes are loaded, virtually eliminating any issues with bike-to-bike interference. Yakima SingleSpeed on display at Interbike. Yakima EasyRider High trailer on display at Interbike. 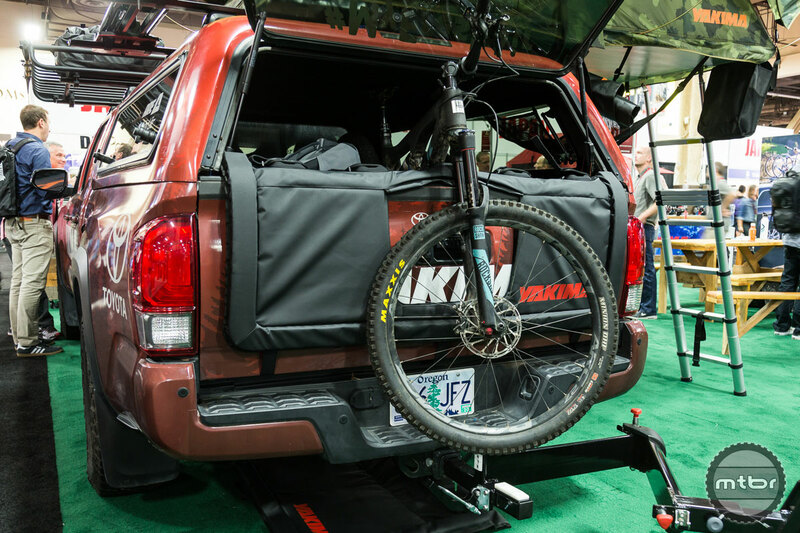 Yakima's new camping accessories include a shoe bag. The GateKeeper tailgate pad, which includes several key updates from the previous version, including padded individual bike cradles and a window cutout so you can still use your vehicle’s back-up camera. The Gatekeeper comes in 5- and 6-bike versions and sells for $139 and $149 respectively. Availability is set for February 2018. 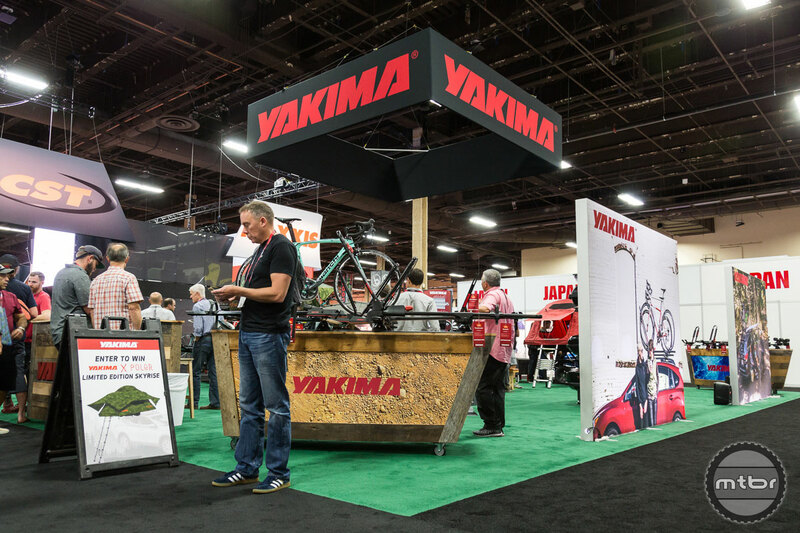 For almost 40 years, Yakima racks, mounts, cargo boxes and base camp products have helped people bring the gear they love to the places they love.